This calculation takes my star cluster calculations to a new level, modelling the collapse and fragmentation of a 500 solar mass cloud (10 times more massive than my previous calculations). The calculation produces a cluster containing more than 1250 stars and brown dwarfs to allow comparison with clusters such as the Orion Trapezium Cluster. The initial conditions were identical to those in the original calculation, but the cloud was more massive and larger in radius. "Stellar, brown dwarf, and multiple star properties from hydrodynamical simulations of star cluster formation"
Simulation & visualisation by Matthew Bate, University of Exeter unless stated otherwise. There are two versions of the movie. One is a 3-D animation of the calculation. It should be viewed through red/cyan, red/green, or red/blue glasses. The second version is identical except for the colour scheme. 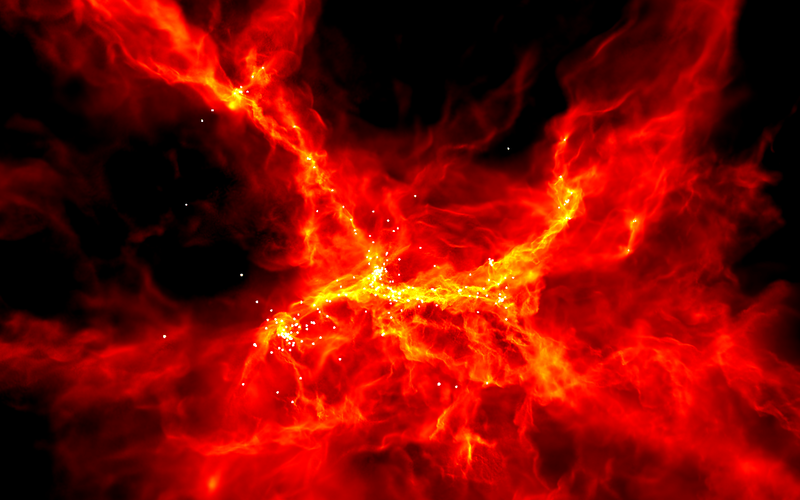 This uses my typical red-yellow-white colour scheme to visualise the column density through the star-forming cloud. 3D movie of the star cluster formation calculation. Standard movie of the star cluster formation calculation. Copyright: The material on this page is the property of Matthew Bate. Any of my pictures and animations may be used freely for non-profit purposes (such as during scientific talks) as long as appropriate credit is given wherever they appear. Permission must be obtained from me before using them for any other purpose (e.g. pictures for publication in books). Quicktime: Plays directly in Powerpoint only on an Apple computer. Can be played under Windows by downloading the FREE Quicktime player from Apple. Some version can be played under Unix/Linux using xanim. The calculation models the collapse and fragmentation of a 500 solar mass molecular cloud that is 0.8 pc in diameter (approximately 2.6 light-years). At the initial temperature of 10 K with a mean molecular weight of 2.46, this results in an thermal Jeans mass of 1 solar mass. The free-fall time of the cloud is 190,000 years and the simulation covers 285,000 years. The cloud is given an initial supersonic `turbulent' velocity field in the same manner as Ostriker, Stone & Gammie (2001). We generate a divergence-free random Gaussian velocity field with a power spectrum P(k) \propto k-4, where k is the wave-number. In three-dimensions, this results in a velocity dispersion that varies with distance, lambda, as sigma(lambda) \propto lambda1/2 in agreement with the observed Larson scaling relations for molecular clouds (Larson 1981). This power spectrum is slighly steeper than the Kolmogorov spectrum, P(k)\propto k11/3. Rather, it matches the amplitude scaling of Burgers supersonic turbulence associated with an ensemble of shocks (but differs from Burgers turbulence in that the initial phases are uncorrelated). The calculation was performed using a parallel three-dimensional smoothed particle hydrodynamics (SPH) code with 35 million particles on the United Kingdom Astrophysical Fluids Facility (UKAFF). It took approximately 100,000 CPU hours running on up to 16 processors. The SPH code was parallelised using OpenMP by M. Bate. The code uses sink particles (Bate, Bonnell & Price 1995) to model condensed objects (i.e. the stars and brown dwarfs). Sink particles are point masses that accrete bound gas that comes within a specified radius of them. This accretion radius is to set 5 AU. Binary systems are followed to separations as small as 1 AU. Click on the images below to view medium resolution, annotated (600x600 pixel) versions. Copyright: Matthew Bate, University of Exeter. 0 yr: We begin with such a gas cloud, 2.6 light-years across, and containing 500 times the mass of the Sun. The images measure 1 pc (3.2 lightyears across). 38,000 yr: Clouds of interstellar gas are seen to be very turbulent with supersonic motions. 76,000 yr: As the calculation proceeds, the turbulent motions in the cloud form shock waves that slowly damp the supersonic motions. 114,000 yr. 152,000 yr: When enough energy has been lost in some regions of the simulation, gravity can pull the gas together to form dense "cores". 171,000 yr.
190,000 yr: The formation of stars and brown dwarfs begins in the dense cores. 209,000 yr: As the stars and brown dwarfs interact with each other, many are ejected from the cloud. The cloud and star cluster at the end of simulation (which covers 210,000 years so far). Some stars and brown dwarfs have been ejected to large distances from the regions of dense gas in which the star formation occurs. 171,000 yr: Close-up views of the star formation. 190,000 yr. 209,000 yr.